GRANDE CABINE 1 NIVEAU, 1 ROI, 1 LIT QUEEN, 1 LIT FUTON DANS LE SALON, GRAND PONT, GRILL, JUSTE AU NORD DE LA RIVIÈRE RUIDOSO ET DU CENTRE-VILLE 2 Chambres, 2 Bains; Belle cabine propre à proximité de la rivière Rio Ruidoso et la zone commerçante du centre-ville et des restaurants. Grand Herbe cour avec beaucoup d'arbres. Chambre principale: Lit king, ventilateur de plafond, douche baignoire. Chambre 2: lit Queen. Hall: baignoire / douche baignoire. Cuisine: entièrement équipée avec four micro-ondes. Blanchisserie: laveuse / sécheuse. Env. 1000 Sq. Ft .; ACC 6; 80 $ CF. We very much appreciate it and are glad you had a great time at Ruidoso River Park. We’re looking forward to your next stay with us. Great customer service by owners, they make you feel welcomed. The cabin was clean and cozy. The property was just great. 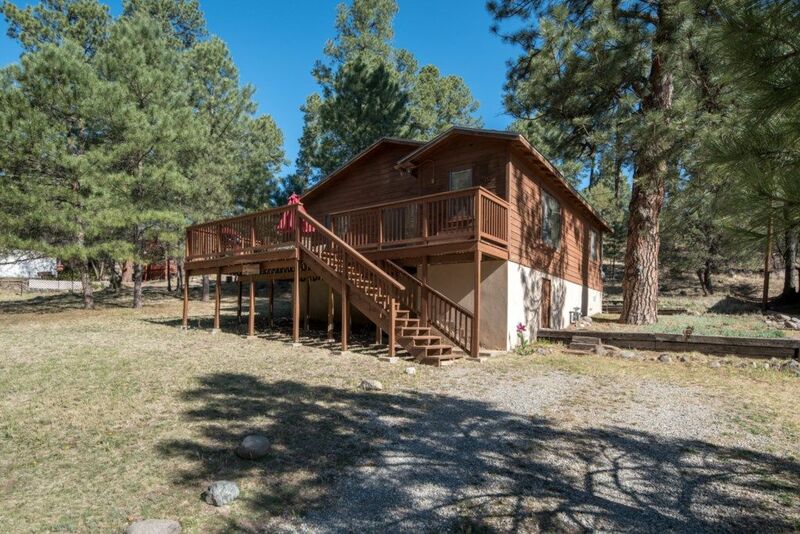 We had a great time in Ruidoso and the Cabin was very nice, lots of deer and the deck is great for early morning coffee and evening drinks. Roberta, it is wonderful to hear such positive comments regarding your stay at Ruidoso River Park! We are so happy you enjoyed yourselves and were able to take advantage of everything this property has to offer. Thank you very much for your kind words. Clean, well maintained cabin. Beautiful, quiet area. Lots of wildlife...elk, deer, fox. We will definitely rent this cabin again. Thank you for the glowing review! We’re so glad you enjoyed your stay at Ruidoso River Park, and we hope to see you again in the near future here in Ruidoso. Thank you for your feedback. We appreciate the fact that you decided to choose Four Seasons and we are very glad to know you had a great stay at Ruidoso River Park. We’re looking forward to your next visit! this was a great find we had a great time just relaxing and enjoying the view the river was right out the front porch and my boys loved just walking along the river . very clean place had every thing you needed for a quick getaway . shopping and restaurants just around the block best part was getting up in the morning and seeing the deer in the front yard will definitely be back .